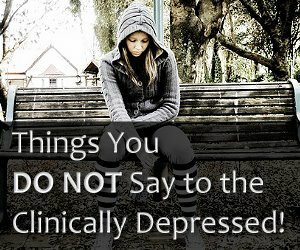 Things You DO NOT Say to the Clinically Depressed! 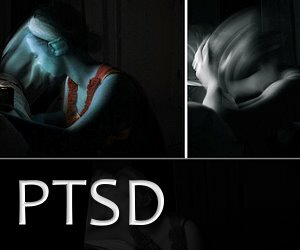 I’ve compiled this list once when I was on depression forum. Having the permission of people who participated in getting this list together, I’m posting it here. Hopefully you’ll find it useful. You just need to be stronger. If it makes you feel better, ______ has it way worse because…. 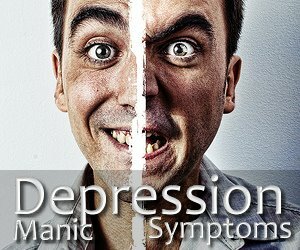 There are people starving and dying of disease in Africa, what right do you have to be depressed? Can’t you just be happy? You’re doing this for attention. When is your next pdoc appt? Oh you are depressed? 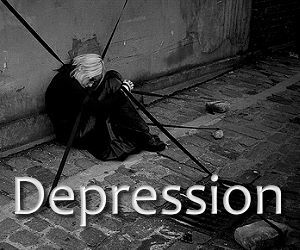 Why are you depressed? Are you still on those happy pills? Go out, have some fun! If you get depressed at things like this, how are you going to cope when real problems come along? Do it! Do it! Go ahead, kill yourself! What do you have to be so depressed about? You should just end it all to put us out of our misery! For god’s sake, there was no such thing as depression/stress in my day…. Come out with us, we’ll get really drunk that’ll cheer you up! Have you figured out why you’re depressed yet? Your face looks like a slapped arse. A smile costs nothing! So I hear you’re on drugs. What’s with that? Come on – Snap out of it! You just have to make yourself happy! Go shopping, relax a little, eat something…that’s what I do! Hey, I heard you’ve been signed off work with stress! What’s going on?! Don’t make a mountain out of a mole hill!!! Come and <whatever>. You’ll enjoy it once you start! Do you have unconfessed sin in your life?